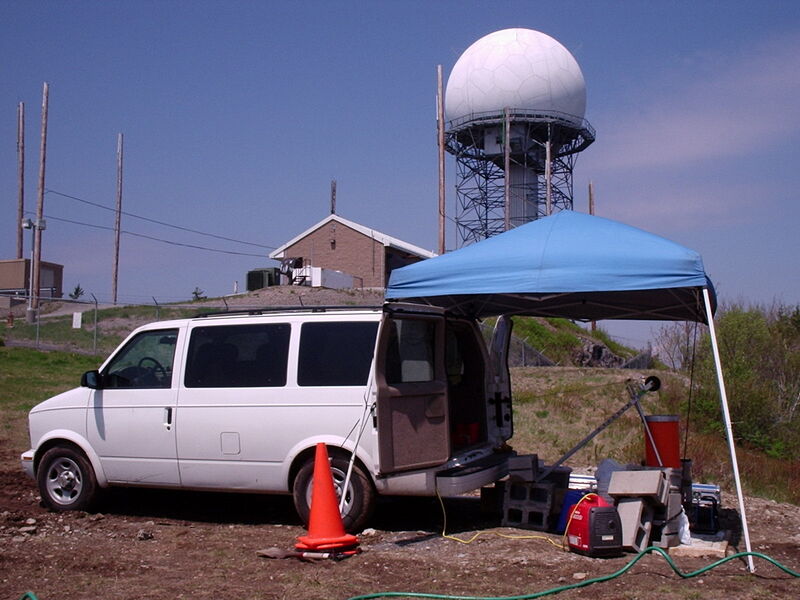 Borehole Geophysical Logging - Hager-Richter Geoscience, Inc. : Hager-Richter Geoscience, Inc. In addition to the numerous surface geophysical services we provide, Hager-Richter also offers a full suite of down-hole geophysical methods to meet our client’s specific needs. Borehole geophysical logging involves measuring the physical properties of the surrounding medium with a sensor located in a borehole. Down-hole geophysical measurements are made in situ and thus can provide highly accurate information about subsurface properties. Down-hole methods also provide a means of correlating geological formations from one borehole to another. 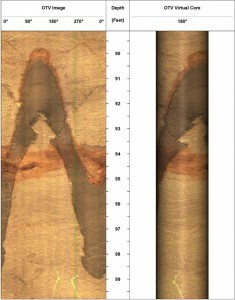 A variety of geologic information can be obtained from borehole geophysical surveys. 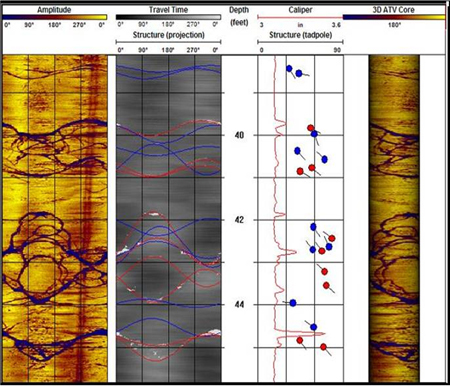 Acoustic and Optical Televiewer logging can be used to determine the depths and precise orientations of bedrock fractures, and has basically replaced oriented coring for many geotechnical project. Hager-Richter has extensive experience with Acoustic Televiewer (ATV) and Optical Televiewer (OTV) logging. We own Mount Sopris Matrix and MGX II slim-hole logging systems with >1500 feet depth capability. In addition to the ATV and OTV tools, we are also equipped to provide fluid temperature, fluid resistivity, 3-arm caliper, heat pulse flow meter, electromagnetic induction, natural gamma ray, normal resistivity, single point resistance, spontaneous potential, and borehole deviation data. The parameters measured by borehole logging depend on the instruments used and the data required. Parameters may include temperature, seismic velocities, natural radioactivity, various electrical properties, and diameter of the borehole. It is our standard practice to provide an interpretation of the borehole logging data. Many other firms provide only the logs to their clients. Our decades of experience and years of research allow us to provide our clients with a clear and concise description of the results, as well as an honest assessment of the limitations. 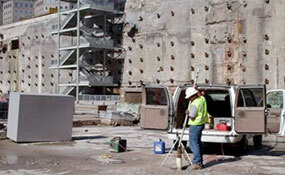 Ground Zero, NY: Freedom Tower Construction, Acoustic Televiewer Logging. 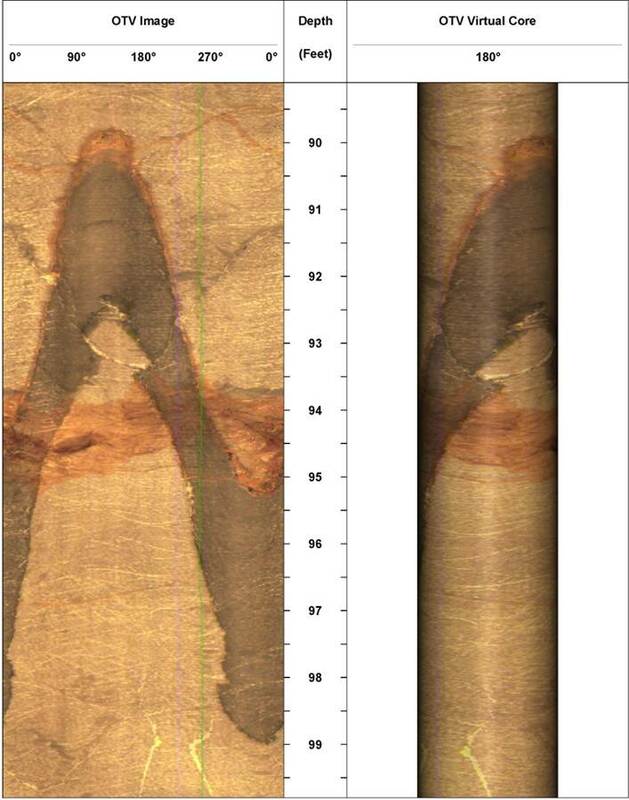 Our client's contract with the US Army Corps of Engineers required an extensive borehole geophysical logging program to provide data to help develop a detailed groundwater flow model in fractured bedrock at a FUDS site in Maine. The site was geologically complex, and access within the site was challenging. We conducted borehole geophysical logging under rigorous QA/QC conditions. The geophysical logs included Optical Televiewer, Acoustic Televiewer, Acoustic Caliper, Fluid Temperature, Fluid Resistivity & Conductivity, Natural Gamma Ray, Single Point Resistance, Spontaneous Potential, Normal Resistivity (8", 16", 64") and Heat Pulse Flow Meter under both ambient and injected conditions. The geophysical results received intense scrutiny from the many public and private stakeholders.